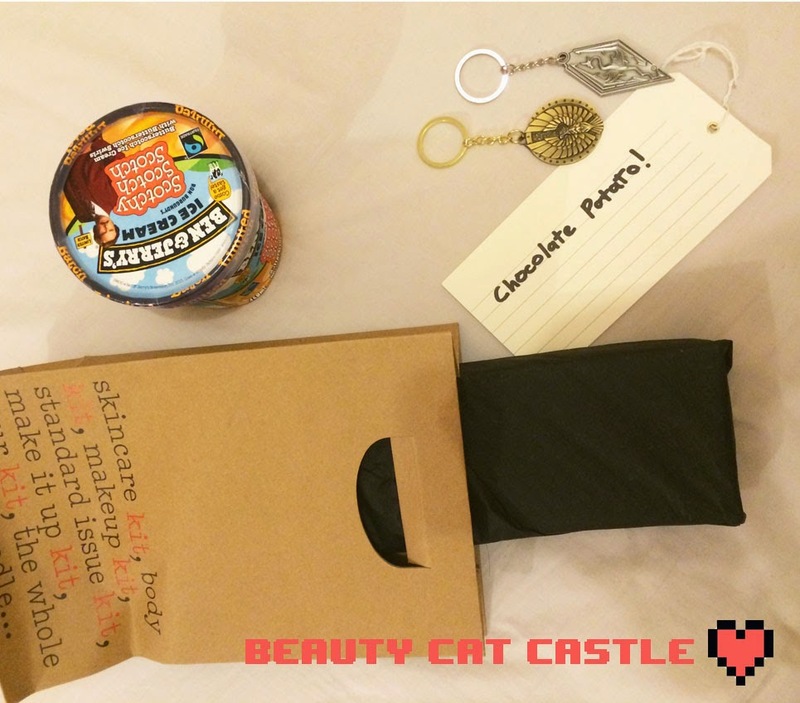 Hail all, today I would like you to meet the new love in my life, which was presented to me as a congrats on the new job present from my other love, as you can see in the pic above the presents included some Ben & Jerry's Ice Cream, and some Elder Scrolls key-rings. 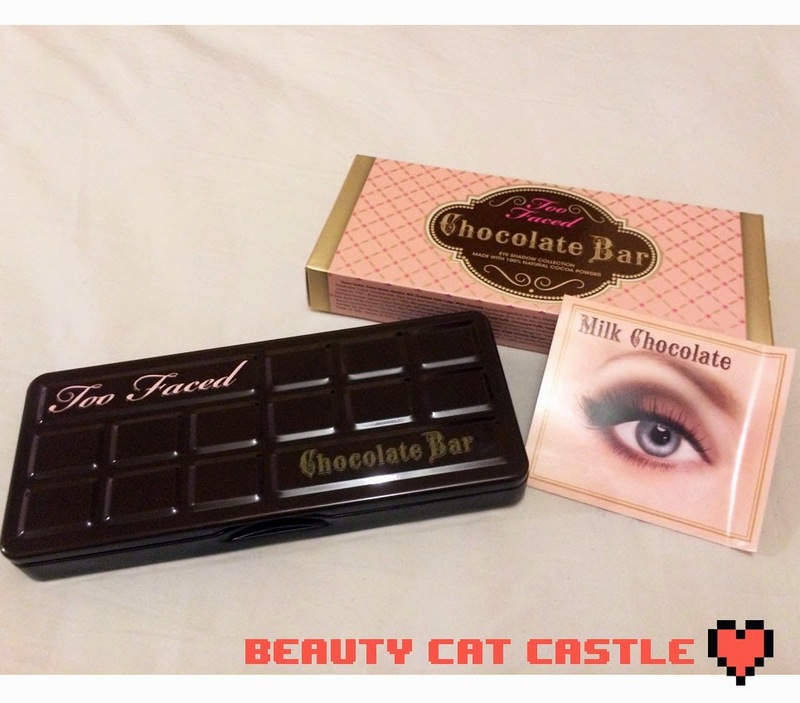 Seriously though the real star here is the Too Faced Chocolate Bar Pallette, and if you want to skip all the text then just know it's amazing. This is only my second "serious" palette (the other being the Naked 2) and I could not be more pleased with it, only one color is really similar and the variation of matte shades makes this an amazing choice for making work appropriate looks. Plus on top of everything it smells amazing, like hot coco powder rather then a chocolate bar. 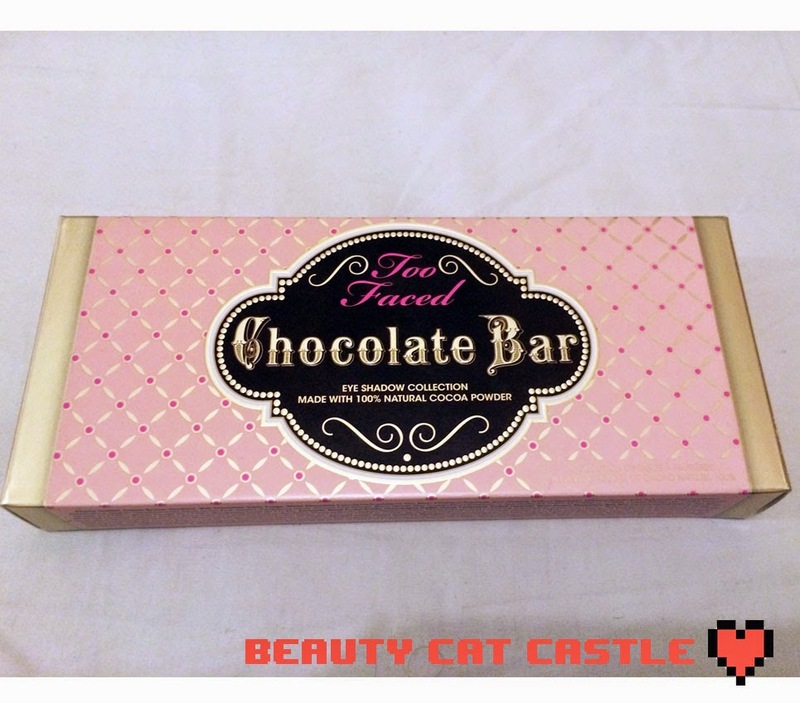 Plus the eyeshadow actually contain coco powder which which is awesome. example looks you could try, I actually found this quite useful as to begin with I was a bit intimidated by this palette and had no clue where to start. 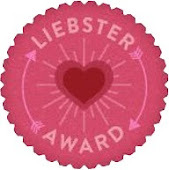 Besides maybe having it framed and putting it on my wall instead. 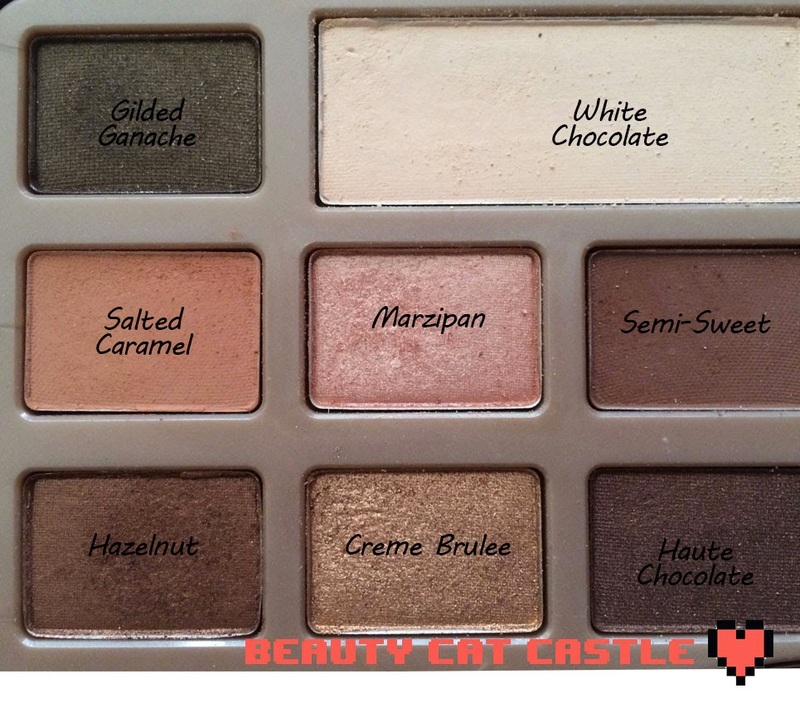 The palette includes 16 shades, with 6 of those being mattes (salted caramel, white chocolate, semi-sweet, milk chocolate, strawberry bon-bon and triple fudge), it makes the palette incredibly versatile in terms of creating safe work looks or going all bling for more special occasions and days of. I've tried all of them since I got it so I feel like it's a good time to share some thoughts with you, besides my first use I have always used this with the Too Faced Shadow Insurance Primer which is all super amazing and will be reviewed shorty as well. 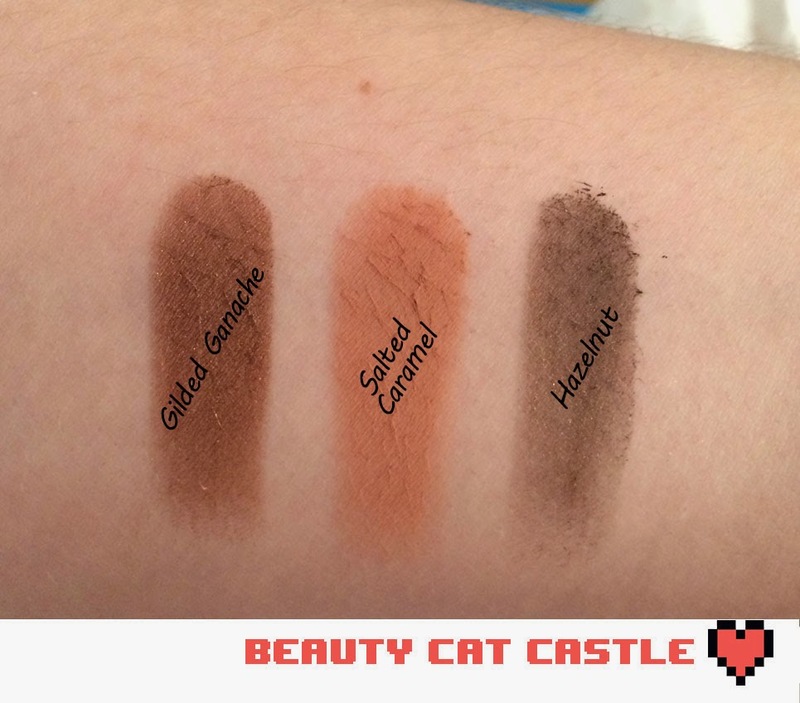 Every shade is super pigmented and blends well with the matte's being a little bit more difficult to use but they are still the best I have tried. 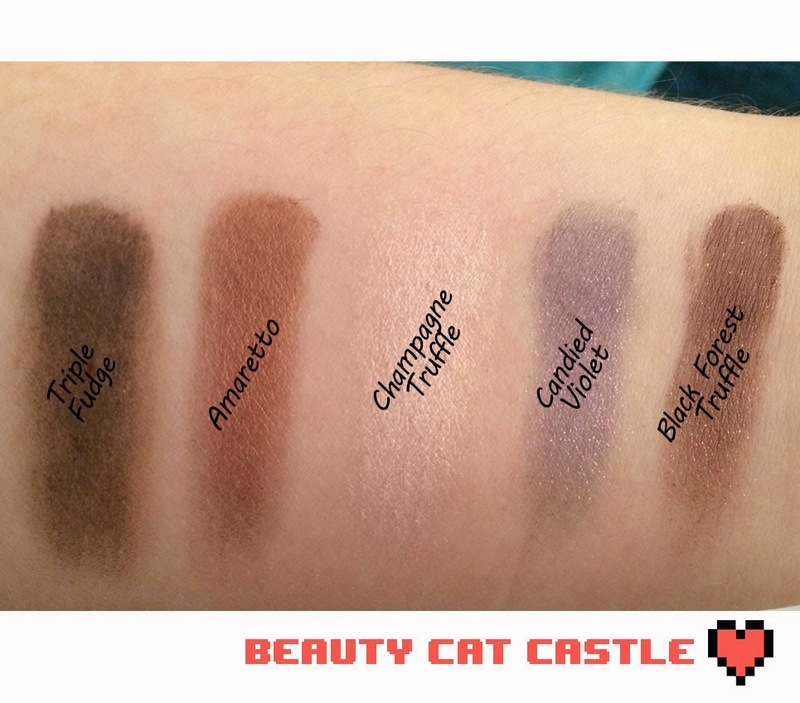 One of my favorite parts about this palette is that the most used shaded (the two highlights, Champagne Truffle & Milk Chocolate) are bigger so your less likley to use them up so much faster then the rest of the shades, in addition the inclusion of unique and unexpected shades like maroon, violet and pink is an awesome idea and makes the palette much more fun. Gilded Ganache: A dark brown, somewhat olive toned with gold shimmer. This one is a little bit harder then most of the others. Salted Caramel: A light brown, slightly orange toned brown matte with lovely smooth texture. Hazelnut: A warm bronze/copper with golden shimmer. Haute Chocolate: A dark slightly taupe brown with warm shimmer. Semi-Sweet: A dark slightly taupe matte with a hint of red. The texture on this one wasn't as amazing as some of the other mattes. Creme Brulee: A golden super shimmer.Very similar to UD's halfbaked. Marzipan: A pink/cream toned shimmer with amazing pigmentation and smooth application, one of my favorite shades. 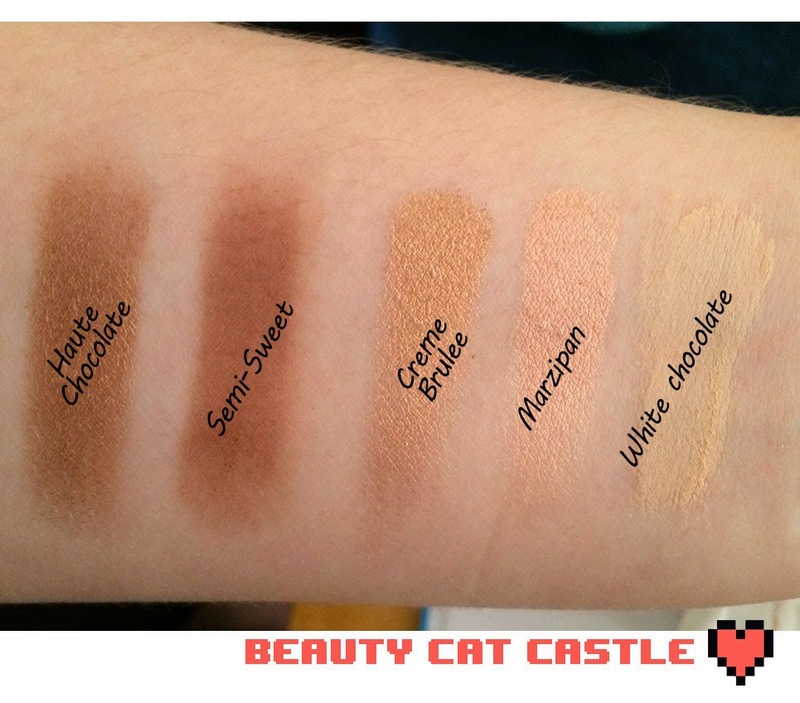 White Chocolate: A creamy beige-milky matte that is super smooth and has a lovely soft texture. 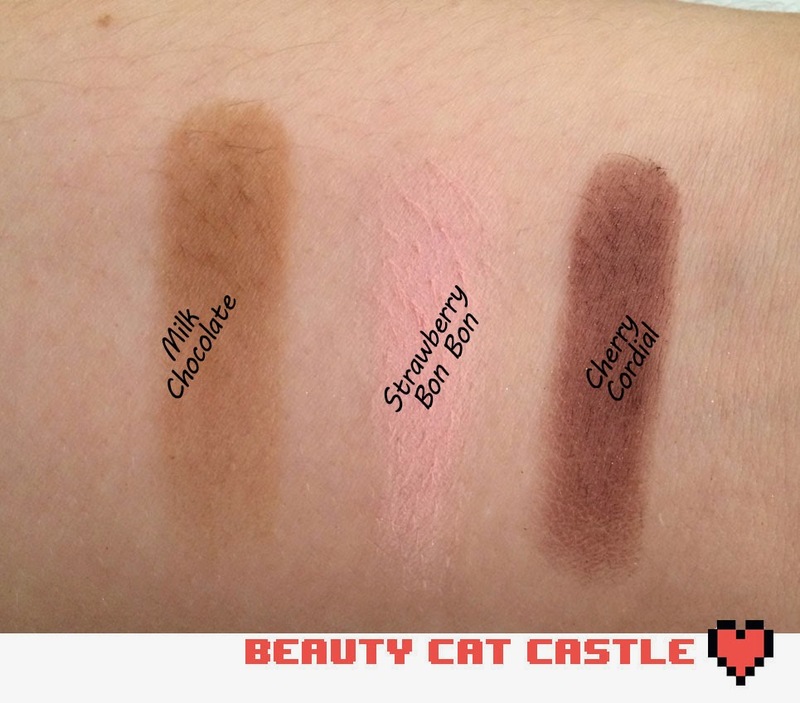 Milk Chocolate: A medium, taupe/brown satin matte with quite good texture. Strawberry Bon-Bon: A light baby pink matte, a little chalky.It's very pale so a white base might be needed to make this stand out more. Cherry Cordial: A deep burgundy with silver toned shimmer. Triple Fudge: A dark brown matte, this was probably the most pigmented of the mattes. Amaretto: A light Burgundy/Copper shimmer with absolutely amazing pigmentation. Champaign Truffle: A cool toned pink shimmer. Candied Violet: A violet shimmer,with lighter lavender shimmer, it was the least pigmented shimmer in the palette, but is an awesome color for a fun smoky eye. Black Forest Truffle: A dark burgundy with a hint of purple and gold shimmer. A little bit hard in texture. 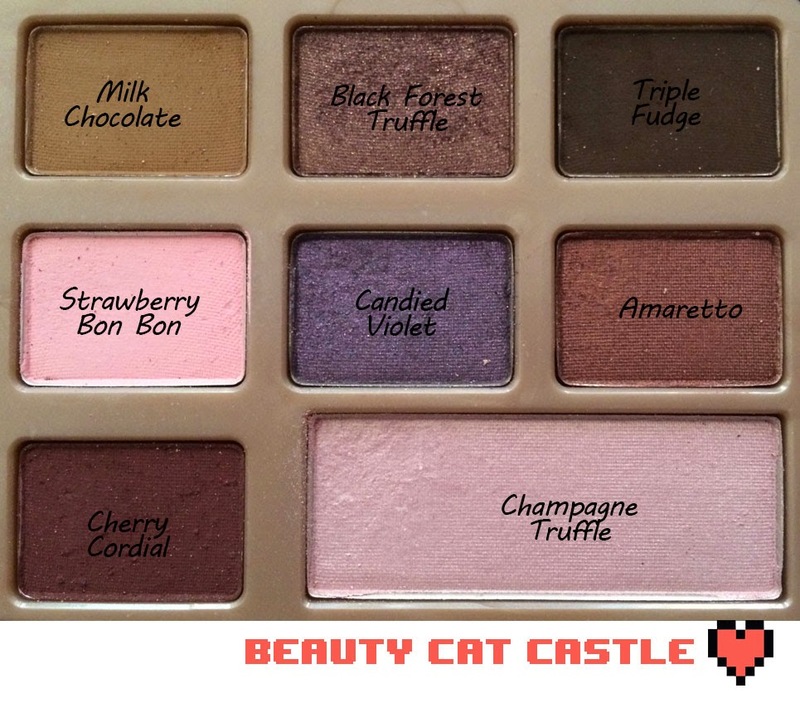 What's you favorite eyeshadow palette? 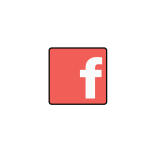 Thanks for a fab review Agnieszka! 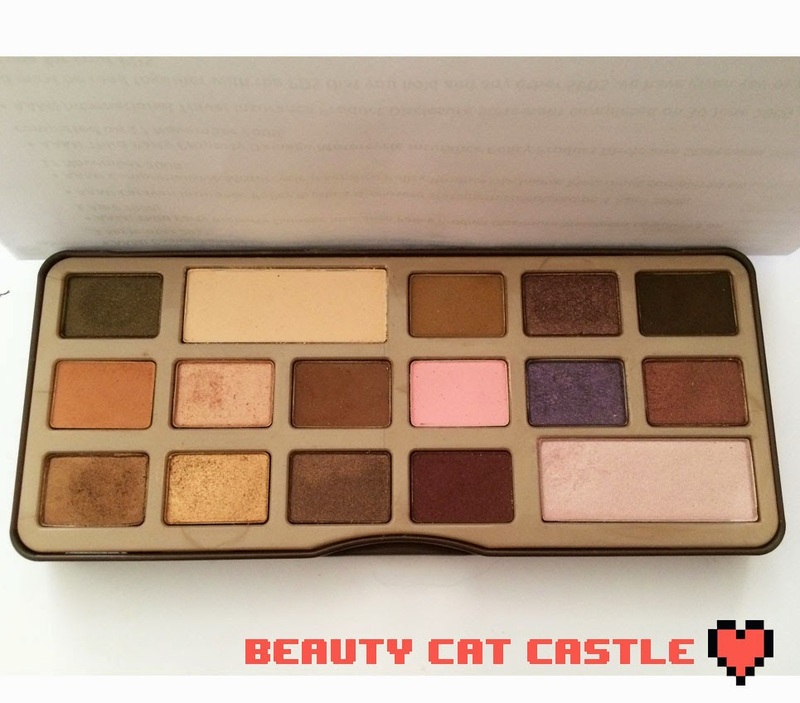 Man I want this palette! All those shades are gorgeous and so wearable. I'll have to add it to my wish list. 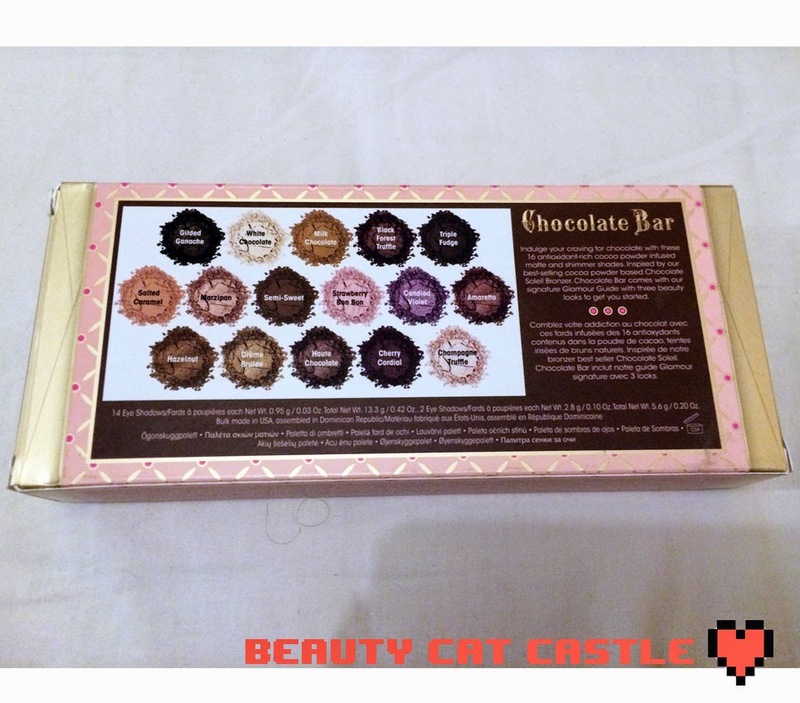 I love how the palette looks like a block of choc too. 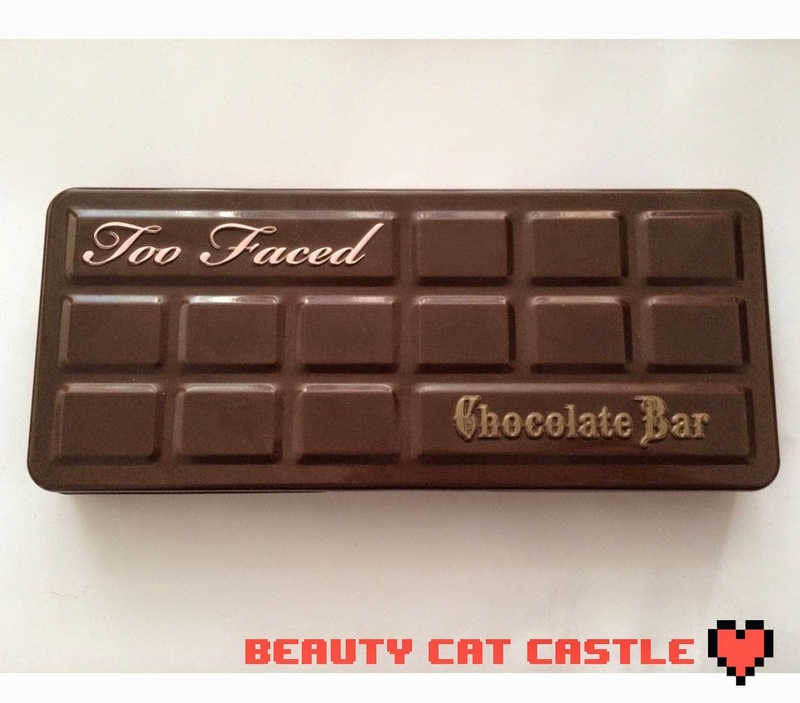 If you get it, I suggest grabbing an actual chocolate bar too because those eye shadows give you some serious cravings! These are just gorgeous. You can never go wrong with some good quality matte shadows and some of the shimmery ones are quite pretty.